MUSIC TYPE Progressive, alternative country/folk. If Brisbane duo The Peachfish have a philosophy, it’s that music can be at its most moving when it’s boiled to the bone. Quiet, simple, at times solemn, at times joyous, but always deeply personal, The Peachfish write music that’s all about the heart, and not the head. And it’s a philosophy that is driving the production of the duo’s debut album, ‘Roses for June’, out February 2004 through FunkFolk/MRA. Recorded over two sessions, the songs were captured live, the same way they were written… in the lounge room of an Ashgrove home. There were no grand visions, no song lists and no overall idea of what the sessions would produce. The only plan was to capture a moment in time, to capture two people playing the music they love together. The result may swing from pop to country to folk, but each track is rooted in the same simple, emotionally driven approach. 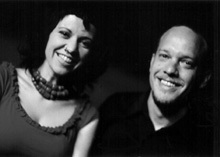 The Peachfish features Deb Suckling and Craig Spann. Regulars on the local acoustic scene for the past five years, the pair elected to take on The Peachfish name largely to end the eternal confusion between their rock band brindle and their stripped-back acoustic duo show. The pair have toured regularly both in Queensland and interstate and have supported the likes of Stella One Eleven, George, IoTA, Tim Steward, Pete Murray, Deb Conway, Lil Fi, women in docs and countless other wonderful musicians. Regulars at Brisbane’s premier music venues including The Zoo, The Healer, Ric’s Café, The Alley and The Troubadour, the pair were invited to play the world famous Spiegeltent as part of the Queensland Biennial this year as well as perform at the Singing Up The Women concert at Woodford. The release of Roses for June will coincide with a major tour in early 2004.